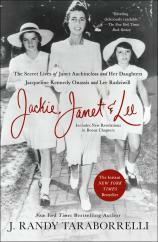 “Do you know what the secret to happily-ever-after is?” Janet Bouvier Auchincloss would ask her daughters Jackie and Lee during their tea time. “Money and Power,” she would say. It was a lesson neither would ever forget. They followed in their mother’s footsteps after her marriages to the philandering socialite “Black Jack” Bouvier and the fabulously rich Standard Oil heir Hugh D. Auchincloss. Jacqueline Bouvier would marry John F. Kennedy, and the story of their marriage is legendary, as is the story of her second marriage to Greek shipping magnate Aristotle Onassis. Less well known is the story of her love affair with a world-renowned architect and a British peer. Her sister, Lee, had liaisons with one and possibly both of Jackie's husbands, in addition to her own three marriages --- to an illegitimate royal, a Polish prince and a Hollywood director. If the Bouvier women personified beauty, style and fashion, it was their lust for money and status that drove them to seek out powerful men, no matter what the cost to themselves or to those they stepped on in their ruthless climb to the top. Based on hundreds of new interviews with friends and family of the Bouviers, among them their own half-brother, as well as letters and journals, J. Randy Taraborrelli paints an extraordinary psychological portrait of two famous sisters and their ferociously ambitious mother.